Vesterbro in Copenhagen. Photo by Canan Marasligil. When I was a kid growing up in Brussels, when internet was non-existent and we had no çanak anten to capture the ever-growing collection of Turkish television channels, my parents used to go to Schaerbeek —a neighbourhood of Brussels where many Turkish immigrants lived, worked, opened shops (and still do)— to buy food, to get a delicious pide, and to rent movies. I was very little, but I do remember vaguely the size of a couple of those shops (there were a few). Even for my then short self, the place seemed rather small. Packed with video tapes - Betamax and VHS, and posters of old Turkish movies: Kemal Sunal comedies, and all the Yeşilçam melodramas and romantic comedies starring the stars of Turkish music and cinema such as arabesk king Orhan Gencebay, action movie star Cüneyt Arkın or the lovely romantic duo Gülşen Bubikoğlu-Tarık Akan. 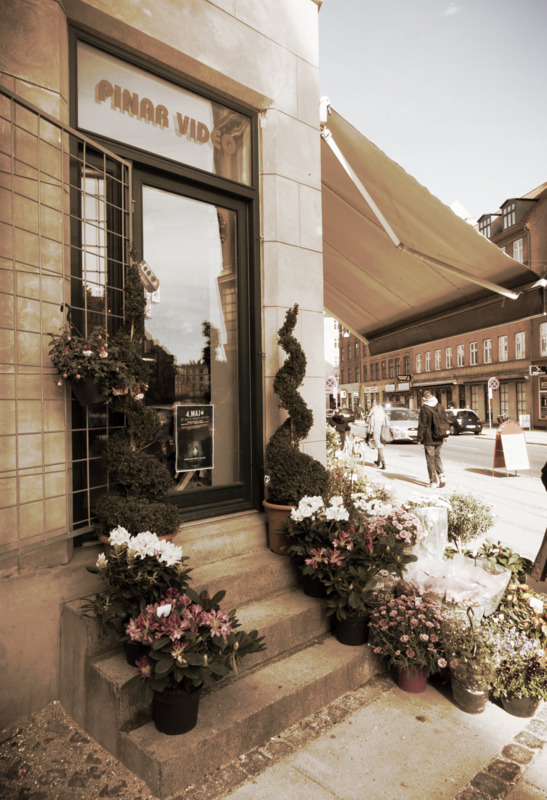 As I wandered the streets of gentrified Vesterbro ("the once-seedy Copenhagen neighbourhood" as the Guardian defines it), I stumbled on a flower shop which kept the sign PINAR VIDEO on its door. Pınar means spring or source in Turkish, it is also a female name. I could imagine a tiny Danish version of myself inside the shop 25 years ago, picking a Kemal Sunal movie with her parents. Instead of mixing Turkish with French while speaking, she would mix her parent's tongue with her perfect Danish. Going home, they would laugh with Sunal, they would cry with Gencebay, they would fall in love like Bubikoğlu and Akan. Until the following week, when they'd go back to the now flower shop, exchange a VHS to ease the gentle pain of homesickness. An ongoing journey until the arrival of the çanak anten. It is certainly not gentrification's fault that PINAR VIDEO now sells flowers. But I most certainly am grateful the sign of that not so far away past is still visible today. You may also enjoy this post showing the trailer of a documentary by Cem Kaya Remake Remix Rip-Off about the copying and remake culture in popular Turkish filmmaking.